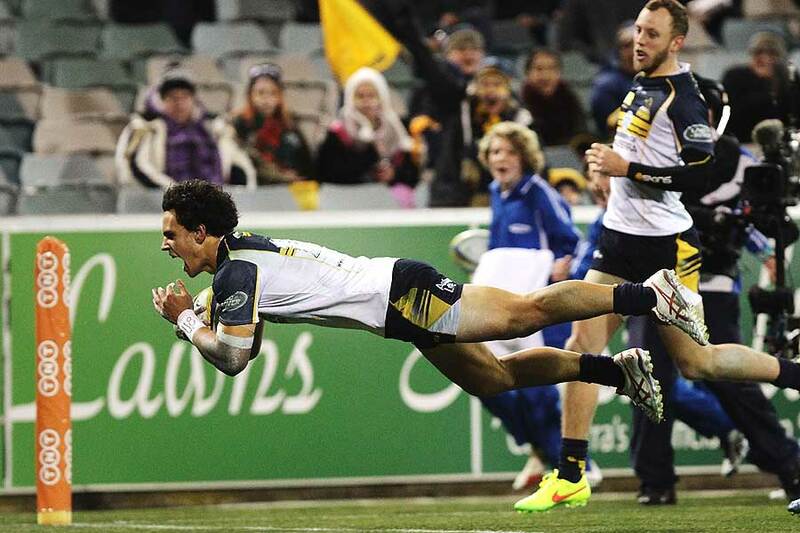 A Matt Toomua three-try masterclass has catapulted the Brumbies into the Super Rugby finals at the expense of the Force in a high-octane 47-25 win at Canberra Stadium. The seven-tries-to-three bonus-point win on Friday night means the Brumbies are hot favourites to earn a home qualifying final, with only a Highlanders upset over the Crusaders on Saturday night able to deny them fourth spot. The Force, meanwhile, are knocked out of finals contention in eighth. As the Force's now ex-winger Nick "Honey Badger" Cummins would describe it, his side were like "that boy who fell out of the tree, they just weren't in it." And much of the misery suffered in his last game before jetting off to Japan could be put down to Toomua. The Wallabies back was huge in his first game back since picking up a groin injury against France, providing the backline with direction severely lacking against the New South Wales Waratahs. He kept opposite No.10 Zack Holmes honest with several trademark big hits, not to mention crossing twice in the opening 30 minutes. There was a lot of help from his forwards, with Sam Carter and Scott Sio providing front-foot ball thanks partly to scrum-half Nic White's snappy delivery. Toomua set the tone early, taking a quick tap before burrowing over a few phases later to open the scoring in the seventh minute. Both sides then traded two penalties apiece, before Toomua spotted a mismatch against prop Kieran Longbottom and sliced over. Toomua was also involved in the Brumbies' next two tries, spinning the ball wide to set up Jesse Mogg and Henry Speight respectively to claim the four-try bonus point in just the 43rd minute. The Force were offered a glimpse of hope after a Pek Cowan try in the 54th minute to take the score to 28-13 with the added bonus of a yellow card to Brumbies flanker Jarrad Butler. 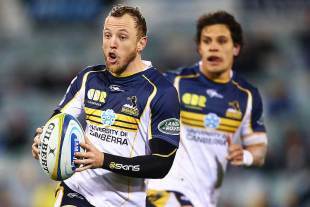 But Speight soon broke through Cummins and then offloaded to Toomua - who notched up the Brumbies' first hat-trick since Mark Gerrard in the 2004 grand final. The two sides both scored two tries each late, with Jayden Hayward and Holmes crossing for the Force, and Joe Tomane and Tom McVerry claiming five-pointers for the Brumbies. "To get a score like that in the final round when a finals spot is on the line is a really pleasing result," Brumbies skipper Ben Mowen said. "I think we'll play the Highlanders next week, the Crusaders will be really strong at home but we'll sit back and wait and see." Force captain Matt Hodgson said despite the loss it had been a great season for the Perth-based side. "We've learned how to win consistently and it's now just a case of learning how to play those big games like tonight and we'll improve again next year," he said.